Analysis: What does the Iran nuclear deal mean? 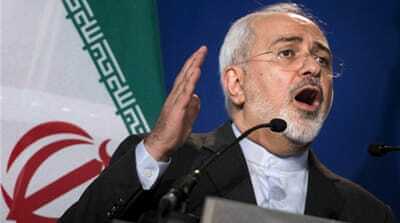 With a deal on Iran's nuclear programme, US opens door to new policy era in the Middle East. Iran, the United States and five other world powers have sealed a breakthrough framework agreement outlining limits on Iran's nuclear programme, despite attempts by Israel and Saudi Arabia to thwart the deal. Al Jazeera spoke with four analysts about why Saudi Arabia and other Gulf countries, along with Israel, are upset about the agreement. A nuclear deal with Tehran, from the Saudi perspective, means two things: Iran will have the ability to improve its economic standing, and the capability to create a nuclear weapon - since the deal will only take effect for a relatively short period of time, 15 years, and will not destroy Iran's technical capabilities to maintain a nuclear programme. Both results would strengthen Iran and its allies in the region. The Saudis believe that trimming Iran's regional influence would increase the chances of a better nuclear deal in the future. This context of an increasing Iranian influence that thrives on weak central governments and sectarian instability - as seen in Lebanon, Iraq and Yemen - is what ISIL capitalises on in its recruitment drive, according to the Saudi view. The immediate Saudi reaction to the deal will likely include attempts to revive the dual structure of the regional order: Saudi versus Iran, which existed until the Arab uprisings in 2011 led to the formation of a third camp comprised of Turkey, Qatar and the Muslim Brotherhood. This camp and Saudi Arabia both exhausted their resources while competing for regional influence, ultimately benefiting Iran. An indicator of the return to the old regional order is the Saudi-led coalition against the Houthi rebels in Yemen. This military campaign has two goals: neutralising non-state actors, which means strengthening the central government, and combating sectarian-inspired conflicts and regional instability. Saudi's new rulers wish to transform the political equation from a balance between the state and non-state actors into a balance between a government and an opposition, both from within the state's framework. In such a situation, both Iran and ISIL would become much less effective.The Saudis believe that trimming Iran's regional influence would increase the chances of a better nuclear deal in the future, as there may always be modifications and alterations to the deal signed this week. In the medium as well as the long run, Saudi officials have said their country would work to acquire deterrent capabilities, which means developing its own nuclear programme. There is a strong chance that Saudi Arabia will seek new alliances, given the decline of US influence and the unreliability of American assurances - and Saudi Arabia, instead of the Americans, would become the first line of defence against its enemies. Indeed, Saudi is undertaking a process of realigning the geopolitical map of the Middle East - but the time that this process will take remains to be seen. 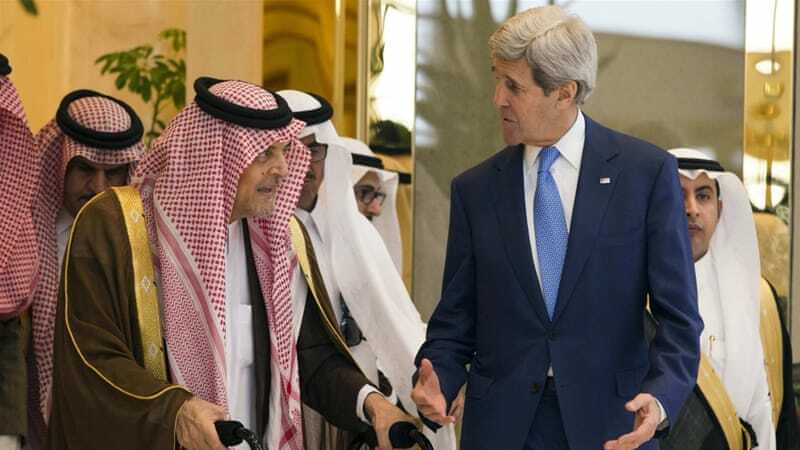 There are mixed reactions in the Gulf towards the Iranian nuclear deal. Those who support a deal - any deal - argue it would prevent the region from sliding into a destructive nuclear arms race that would deplete everybody. But others say the deal will have a number of negative consequences for the Gulf. The secretive nature of the talks made many uncomfortable about the outcome, as did the absence of Gulf Cooperation Council (GCC) members. Wisdom has it that if you do not have enough cards on the negotiating table, you may not get everything you want, but if you are not even present, you will certainly get nothing. A compromise between negotiating parties would stipulate mutual concessions, and the question remains: Beyond the lifting of economic sanctions, what would Iran want in return for ending its nuclear programme? In Geneva, everybody concerned was present except for the Gulf states, which would be directly impacted by any kind of agreement in their backyard. Additionally, any deal between Iran and the US would likely not be favourable to the GCC states. A compromise between negotiating parties would stipulate mutual concessions, and the question remains: Beyond the lifting of economic sanctions, what would Iran want in return for ending its nuclear programme? The US surely does not want to see a more powerful Iranian hegemony in the region, but at the same time, it does not appear to mind some kind of Iranian influence in the region. Iran has been seeking to reclaim its previous role as the region's police. It is clear that a western recognition of Iranian regional influence would come at the expense of the Gulf states, given that they are the weakest link in the regional chain of influence. In the post-deal reality, there would be three regional powers: Iran, Turkey and Israel. From an economic perspective, any agreement between Iran and the West would certainly lead to the lifting of sanctions on Iranian oil exports that are estimated at between one and 1.5 million barrels a day. This would further flood the already saturated oil market with cheap Iranian oil, bringing prices even further down. If this persisted, it would have adverse economic consequences on the Gulf states, which are already financially overstretched. In light of these shifting realities, the Gulf Arab states may be wise to make a number of changes to preserve their long-term interests, including to abandon their military and security alliance with US in favour of their own joint military cooperation. The Gulf states should also build strategic partnerships with the regional powers of Pakistan and Turkey, who share the Gulf nations' fears of Iranian ambitions in the region. Finally, the Gulf states would need to improve internal GCC relations; indeed, their cooperation in the Yemen air campaign has shown that these states can not only work together on regional threats and initiate major actions, but also have the potential to become a major regional player capable of countering US-backed Iranian hegemony. Only in the miniature Israeli world of the Game of Thrones - a world of imagination - might Iran, whose GDP is about two percent of that of the US, possibly constitute a threat to the most powerful empire in history. In the real world, such a threat would not exist even if Israeli Prime Minister Benjamin Netanyahu inflated the numbers of Iran's centrifuges 32 times, contradicted and ignored his own government's intelligence assessments, and used the hitherto common imperial tactic of psychopathologising Iran and Arab resistance leaders. On March 29, Israel's Ynetnews reported that "Iran has tentatively agreed to limit centrifuges used to enrich uranium to 6,000 - or even less". Thus, applauding Netanyahu's magical 190,000 number in the US Congress must seem foolish today. Al Jazeera's publication of leaked "Spy Cables" also revealed that Israel's Mossad contradicted Netanyahu on Iran's nuclear programme. Even dismantling Iran's civilian programme entirely does not satisfy Netanyahu's appetite; it is the Iranian 'policies', 'behaviour' and 'state' that he wants eliminated. An Iranian nuclear bomb - one that belongs to the world of imagination, according to most experts - does not even constitute a threat to Israel, let alone the US. A newly released US document from a 1987 assessment of Israel's nuclear weapons capabilities by the US Pentagon stated that Israel was experimenting with coding, "which will enable them to make hydrogen bombs", described as "a thousand times more powerful than atom bombs". That was the US assessment of Israel's programme 28 years ago. It is not surprising, then, that US President Barack Obama is not fooled by Netanyahu's absurd account. A careful reading of Netanyahu's speech reveals that it is Iran's competitive regional status and rising power that concerns him the most, not the fantasy of an existential threat. It is the regional balance of power, not the bomb. Even dismantling Iran's civilian programme entirely does not satisfy Netanyahu's appetite; it is the Iranian "policies", "behaviour" and "state" that he wants eliminated. According to experts with Israel's Institute for National Security Studies, the nuclear deal is dangerous because it could "widen the existing disputes between the Israeli government and the US administration". Israeli strategic experts argued in the most recent Hertzliya's Conference that the US is "the most important political and security asset that Israel has in the international sphere". Neither Iran nor the US is interested in military confrontation and both have much to gain from an agreement. But since this deal will constitute a building block towards diplomatically resolving other regional conflicts involving Iran and the US, all sides have been negotiating with their eyes on the future. For all forces involved, winning and losing are not etched in stone. Saudi Arabia and Israel can be either losers or winners. If they really do not want a bomb, they are winners. If they want Iran to stop being Iran - if they seek nothing less than Iran's destruction - they will definitely lose. The fear in Israel is that Iran's development of any nuclear technology will move it closer to becoming a nuclear threshold state, capable of developing a bomb at short notice should its interests be threatened. Netanyahu has spoken endlessly of a supposed genocidal intent from Iran's Shia leaders, invoking imagery of an impending second Holocaust of the Jewish people. But the real problem for Israel is that a nuclear Iran endangers its decades-old strategy of establishing itself as an unrivalled military power in the Middle East. That status depends on Israel being able to threaten large states like Iran into submission, contain them militarily and prevent them from spreading their influence beyond their own borders. Israel's monopoly on nuclear arms in the region - with an arsenal of as many as 200 warheads, entirely unmonitored by the international community - has secured its position as the region's hegemon. But all of that was placed in jeopardy by the Iran talks. With a nuclear-armed Iran, Israel would also be severely limited in its ability to strike against Tehran's regional allies, including the Lebanese Hezbollah, possibly the single most formidable foe Israel faces. Iran's leaders only need to look to neighbouring Iraq to draw conclusions about how important a nuclear deterrent is. Israel destroyed Baghdad's Osirak nuclear reactor in 1981, and the US invaded and occupied Iraq in 2003. A nuclear-armed Iran - or even one that was days or weeks from developing a bomb, with the facilities hidden deep underground - would be off-limits to any such serious military attack. Israel has been regularly targeting attempts by Iran and the crumbling Syrian regime of Bashar al-Assad to transfer weapons to Hezbollah and to fortify their joint positions, including next to the Golan, against Sunni Islamist groups trying to overthrow Assad. Effectively, Israel has been playing off the forces vying for power in Syria to keep them all exhausted by the fighting. Israeli air strikes in Syria designed to weaken Iranian influence - such as the one in January that killed a dozen senior Hezbollah and Iranian commanders - would be unthinkable if Tehran had a bomb. Israel would have to resign itself to the fact that having powerful military forces just across the border, united under the umbrella of an Iranian bomb, would be a match for Israel's own army. As a result, Israel would face its own Cold War in the Middle East, with the ultimate threat of mutually assured destruction should either side try to push unilateral measures too far. But Israel's fears extend further. Until now, Israel has faced no serious competition over its strategic alliance with Washington, and especially the Pentagon. The special relationship is rooted in Israel's nuclear arsenal and the military might it wields in the Middle East as a consequence. Israel's nuclear weapons, developed in the late 1960s over the White House's opposition, burrowed into the heart of the US security establishment. Israel exchanged its so-called "Sampson Option" - the threat of inflicting nuclear annihilation - for access to US intelligence, aid and arms programmes that provide it with an unchallengeable military edge. But were Iran also to become a nuclear state, that special relationship might quickly erode. Washington policymakers would have to take into account not just Israel's strategic concerns, but Iran's too. In fact, given Iran's control over access to much of the Gulf's oil, an Iranian nuclear weapon might cement Tehran's position as Washington's most privileged partner in the region. Rival military power centres in the Middle East would transform the White House and Pentagon's assessment of US strategic interests in the region. The consequences would likely be felt most acutely by Israel in its conflict with the Palestinians. While Iran would be able to intensify its support for Palestinian resistance groups such as Hamas or Islamic Jihad, Israel would have limited options for a response. With the constant danger that tensions between Israel on the one side and Lebanese and Palestinian resistance movements on the other might escalate into a nuclear standoff with Iran, the US would have a much greater incentive to force Israel to solve its conflict with the Palestinians, something it resolutely opposed till now. Iran and global powers have sealed a deal on plans to curb Tehran's chances for getting a nuclear bomb, laying the ground for a new relationship between the Islamic republic and the West. Though the agreement was hailed as a major breakthrough in a 12-year standoff between Iran, Europe and the United States, world leaders toned down their reactions, underlining a lack of trust in Tehran and scepticism in some quarters that the hard-fought deal could last. This framework would cut off every pathway that Iran could take to develop a nuclear weapon. I am convinced that if this framework leads to a final comprehensive deal, it will make our country, our allies and our world safer. This deal is not based on trust. It's based on unprecedented verification. The effect of this will be, when we implement our measures there won't be no sanctions against the Islamic republic of Iran. And that I think would be a major step forward. We have stopped a cycle that was not in the interest of anybody, not in the interest of non-proliferation. We have built mutual distrust in the past...So what I hope is that through courageous implementation of this some of that trust could be remedied. But that is for us all to wait and see. Diplomacy had paid off, insisting that "simply demanding that Iran capitulate makes a nice sound bite, but it's not a policy". If we find at any point that Iran is not complying with this agreement, the sanctions can snap back into place. "In return for Iran's future cooperation, we and our international partners will provide relief in phases from the sanctions that have impacted Iran's economy. This deal contains the principal put forward by Russian President Vladimir Putin, which is Iran's unconditional right to a peaceful nuclear programme. 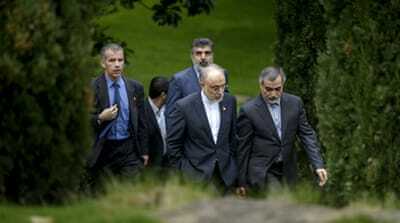 The international community had never "been so close to an agreement preventing Iran from having nuclear weapons". France will be watchful ... to ensure that a credible, verifiable agreement be established under which the international community can be sure Iran will not be in a position to have access to nuclear arms. The deal will pave the way to bolstering "peace and stability" in the Middle East and allow cooperation on the "many serious challenges (countries) face" in the region. The accord is a "historic mistake". The final deal based on this agreement "would threaten the survival of Israel". A historic turn in the tide of animosity that has defined the relationship between Iran and the West since 1979. A long and difficult path lies ahead regardless of whether there's an interim deal, half a deal, or no deal at all.